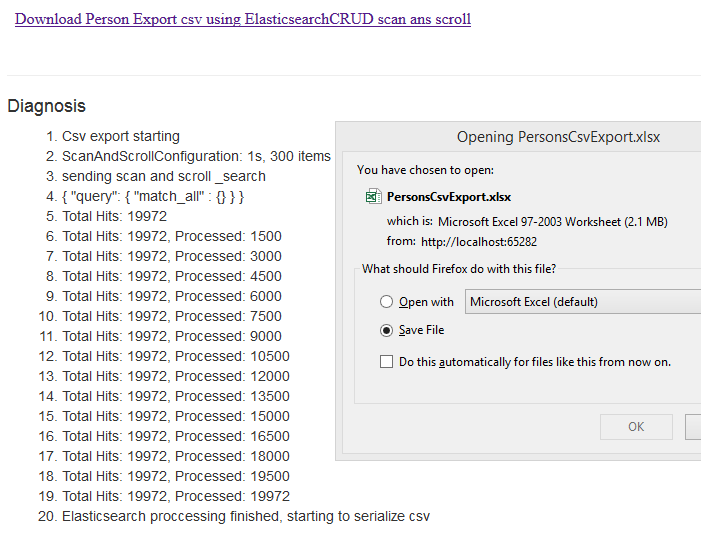 This article demonstrates how to export data from Elasticsearch to a CSV file using Web API. The data is retrieved from Elasticsearch using _search with scan and scroll. This API can retrieve data very fast without any sorting. The data is then exported to a CSV file using WebApiContrib.Formatting.Xlsx from Jordan Gray. The progress of the export is displayed in a HTML page using SignalR (MVC razor view). The export uses the persons index created in the previous post. This index persons_v2 is accessed using the alias persons. Because the index has almost no data, about 20000 records, the export can be exported as a single CSV file or in a single chunk. The Person class is used to retrieve the data from Elasticsearch and also export the data to the CSV file. The different attributes are added as required. Now that the data model is ready, the export can be implemented. This is completely implemented in the PersonsCsvExportController class. The GetPersonsCsvExport method gets the data, exports it to a CSV file and adds diagnostic messages to a HTML page using SignalR. The scan and scroll function can be used to select data fast without any sorting, as sorting is an expensive operation. The first request which uses the _search API (SearchCreateScanAndScroll), defines the Query for the scan and returns the total amount of hits for this query and also a scrollId. This scrollId is then used to retrieve the next scroll. The scan is configured with a ScanAndScrollConfiguration class. The class defines the amount of items to be retrieved (max) pro shard within the defined time limit. if 300 is defined, and the index has 5 shards, 1500 documents will be scrolled pro request if the server can complete this within the time limit. All of the following scroll requests returns a new scrollId which is then used for the next scroll (n + 1). This is repeated until all documents from the scan have been selected. The TraceProvider sends messages to all clients, if the trace event level has a lower value than the min value defined in the constructor. Scan and scroll can be very useful if you need to select large amount of data from Elasticsearch in a unsorted manor. This is useful for backups, reindexing or exporting data to different mediums.